There’s so much to unpack from this one. 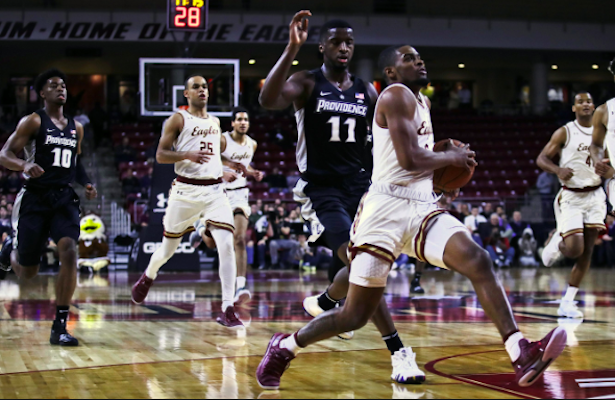 That’s Providence freshman sensation AJ Reeves scoring the three most significant of his 24 points in the Friars’ 100-95 overtime victory over Boston College. The win was Providence’s first at Conte Forum since 2004, but this was a homecoming for Reeves. He spent his high school days at the Brimmer & May school, on the doorstep of Boston College’s campus. And week by week the college basketball world is beginning to learn what the folks at Brimmer already knew. This is a special scorer. Reeves didn’t just bury the 3-pointer to tie the game with two seconds left in regulation (he was freed thanks to a terrific screen by Nate Watson — more on him shortly), he stabilized the offense when BC surged late. An 8-2 run pushed the Eagles ahead by six with just under eight minutes to play in what had been a one possession game for much of the second half. After a Providence turnover, it looked as though PC was unraveling a bit in its first true road test. But Reeves turned the game around with eight points in a two minute spurt. 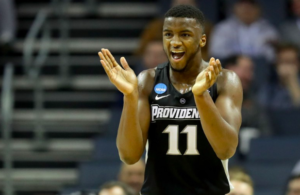 He was fouled on a 3-point attempt, finished a difficult and-1 layup, and then drilled a 3-pointer off of a pin down screen from Watson that looked very similar to the play Providence tied the game on in the final seconds of regulation. Reeves then collapsed BC’s defense on the next possession. His drive resulted in a missed layup that Alpha Diallo recovered at the rim for a layup to make it 75-73 Providence with over five minutes to play. Reeves was phenomenal (even Deion Branch knows), but this was a complete team effort. We don’t know what the identify of this team will be, but in a pair of rivalry games over the past three days one thing has been clear — this group plays with an edge. There was an ongoing dialogue between the Friars and URI on Saturday afternoon — and it wasn’t just the upperclassmen. Jimmy Nichols was in the ear of Cyril Langevine at times and David Duke was letting the Rams hear it after he scored at the rim. Reeves shoved Boston College freshman Wynston Tabbs out of PC’s huddle with 11 seconds left in regulation which let to a minor dustup, while Watson and Eagle big man Luke Kraljevic mixed it up after a whistle in overtime. Of course, none of this would matter if it didn’t translate to game action. We learned a lot about this group when they responded to BC’s 15-0 run in the first half (sparked by the hot shooting of Portsmouth, RI native Chris Herren Jr.), overcame 45 BC foul shots, and the disqualifications of Diallo, Duke, and Maliek White. We saw Diallo bounce back from his third straight poor offensive half. PC’s junior star went without a field goal against URI, and again in the first half versus BC. With Boston College’s offense clicking early in the second half, Diallo got himself going with a corner 3. He then grabbed an offensive rebound and bucket to bring the Friars to within five, finished a beautiful spin and left handed layup, and scored off of a curl while getting fouled on the next possession. Diallo made his first four shots of the second half, and his personal 7-0 run on the final three baskets erased BC’s seven point advantage. The Eagles (now in the ACC) had no answer for Watson (a throwback Big East big man) on the block. The sophomore center played volleyball over BC defenders on the glass in finishing with a 19 point, 10 rebound double double. Watson put PC up 55-53 with a shot in the paint, assisted on Isaiah Jackson’s layup to tie the game at 61, and broke that tie with a half hook shot. With under two minutes to play and the Friars trailing by three, Watson grabbed an offensive rebound and was fouled. He made both to bring the Friars to within one. The overtime session was more of the same. Duke found Watson for an and-1 to kick off the scoring, and then Watson nailed four consecutive free throws late. 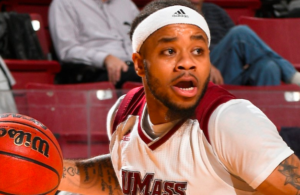 Not to be overlooked are PC’s point guards. 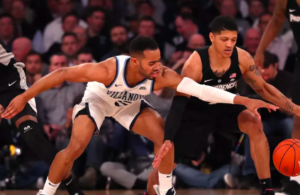 Duke shined at Mohegan Sun against South Carolina, but this was his most complete game as a Friar — nine points, a season high nine assists, and just two turnovers in 35 minutes. More significantly, he was a major reason why Boston College star Ky Bowman shot 6-19 from the field. Boston Celtics General Manager Danny Ainge was one of many NBA officials in attendance to see Bowman. Maliek White made big plays, including a tough bank shot late in the first half as BC was in the midst of a 21-4 run. A miss there and Boston College had the final shot of the half with a chance to go up eight or nine. White then scored on a tricky drive with under five minutes left in regulation to give PC a one point advantage before finishing a very difficult and-1 with under a minute remaining to tie the game. Maliek White with the huge, tough bucket for Providence! The overtime session was a mix of momentum, solid free throw shooting, and will carrying PC to victory. At one point, Ed Cooley had three freshmen and a sophomore on the floor in OT, and he eventually lost Duke, White, and Diallo to fouls. It didn’t matter. Watson and Jackson finished BC off at the free throw line in the final two minutes of overtime and the majority Providence crowd walked out of Conte Forum winners for the first time in far too long. The young Friars are a sleeper team at this early point in the season, but I predict that last night’s win on the road as the underdog vs. ACC talent will prove to be the true beginning of a coming out. They’ll indeed be on the radar in very short order, especially since it seems like the Big East may be a little down this year. Coach Cooley has assembled a true program. It’s been awhile since Providence has had a pure shooter; welcome, Mr. Reeves. PC simply finds a way to win! They cut their turnovers down to 10 but still need to make free throws. Every game they get better. Love their energy and the way they listen to Coach Cooley during the time outs. I’m a big Langford fan. Want him to do well. I just think he’s not strong enough at this point. In man he gets run over and on offense he is timid. Wish he got red shirted! Think he needs another year of physical and mental growth. I probably do as well!!!! GO FRIARS BABY!!! I agree with everything Kfar wrote. However I would like to congratulate our Sixth Man who was also integral in our victory. None other than BC Big Man dopey Luke Kraljevic who paled in comparison to Hamilton.